This post contains affiliate links. When you click through and make a purchase, SewHere receives a small commission at no expense to you. Thanks! Zede and Mal reminisce about some of Zede’s old furniture and one gate leg table is front and center on Mal’s mind. Mallory swears this table is some sort of witchcraft. Zede has researched this table a bit and these styles of tables were made in the late 1700’s through to the late 1800’s. She believes hers could be from the late 1800’s as it was most likely her grandmothers and the date would be close. Or it could be a really good slightly newer than late 1800’s replica, either way it’s old. She had this table in her attic for 15 years or so and while moving around her breakfast nook she got it down to use and thought it would be great if she could add a leaf to it to make it larger. As she cleaned it up she noticed how easy the top wanted to separate, was the table broken? No, it pulls apart and there is a gizmo in the middle and after a little fiddling a leaf pops up! Turns out the table stores it’s own leaf. The leaf is cut in half and is hinged to the table and itself so it folds down and flips around and stores nice and tidy in the table. Zede is amazed at how it was so purposefully made and how ingenious and efficient it is – qualities also in sewing furniture. When machines first came into homes they came in furniture. This furniture was not very portable but it was well thought out as far as how much space they took up and their efficient use. Almost all of these earlier cabinets were made of wood. Zede believes all of the earliest home sewing machines came in cabinets (we may need more research to 100% confirm this). The machines generally were able to fold down into the cabinet and the cabinet then had a piece of wood that hinged shut covering the machine and making a flat surface for other uses. A lot of the time the machines that came with the table could not stand alone as the table was the base of the machine. Later there were portable machines in smaller wooden cases as opposed to tables. Zede’s first sewing machine was given to her in the 60’s and was a smaller machine in a wooden case. Sewing furniture is not a new concept and it used to be really essential to working and storing the machine. Machines used to be considered a home appliance and more of a necessity than today. That machine was probably always out in the dining or living room and put up when not needed. The table it turned into was then used for other things like a sideboard. These home sewing machines were viewed more like how we view washers, vacuums, and refrigerators today. They don’t make machines in cabinets in these modern times because the need for more portable machines arose. Now there is a variety of machines and furniture to fit them making it much easier to get exactly what you want. Zede, who ran a sewing store for many years says if you have one of these older cabinet models know that it can come out of the cabinet for servicing as it’s only connected with a couple set screws. She says, please don’t bring the machine in with the cabinet. Do you need specialized sewing furniture? Mal and Zede both agree, you do not need to have super specialized sewing furniture to be a successful sewer. They also agree that if you don’t have furniture made especially for sewing, set yourself up for success with a sturdy work surface. This surface should also be ergonomic and the right height for you to work at. The worst surfaces to sew on for them are those white lightweight fold out plastic tables. Zede says these are great for picnics and holidays but for sewing – not so much. Zede equates it to sewing on a surf board. She says the machine goes up and down with the table as the machine runs. She remembers having an 8ft. one at the shop and it just didn’t cut it for sewing on. Zede says when she started sewing she sat at the dining room table and lots of people probably do because these tables are usually quite sturdy. She also sat in a dining room chair which didn’t really work for her height so she placed her bum and the machine pedal on some ancient relics – phone books! an adjustable chair if possible – Zede likes it adjustable because depending on what she’s sewing she may want to be up a little higher or lower. 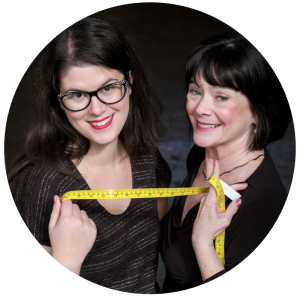 This week’s Podcasts and live broadcasts are brought to you by LA Finch Fabrics. 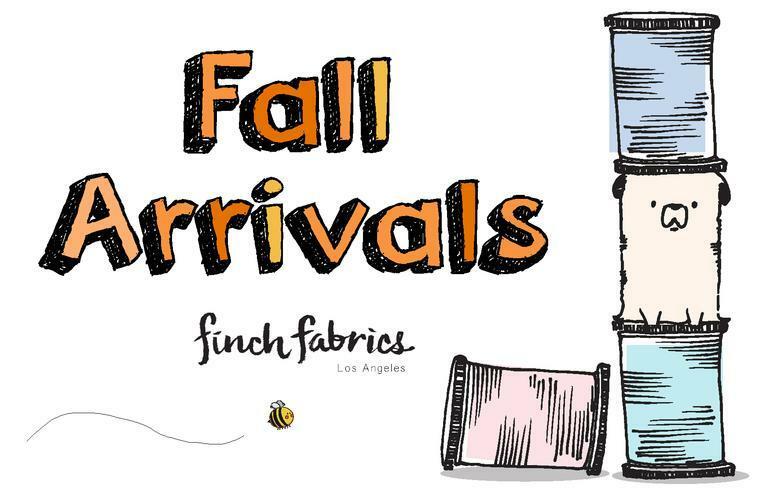 LA Finch Fabrics is your source for gorgeous designer ends and fabulous knits straight from the Los Angeles garment district. They’ve been a Sewing Out Loud sponsor from the beginning and our community raves about their fabulous customer service- not to mention the wonderful selection of fabrics. Go to LAFinchFabrics.com to browse thermal knits, stripe packs, stretch wovens, and double brushed polyesters. Oh, and don’t forget, there’s free US shipping on orders over $99. Use code “SSW5” at checkout to receive $5 off your $25 order. Good through November 30th, 2018- not to be combined with other offers. Zede and Mallory were sewing dealers and have seen, used, and sewed on some of the most advanced sewing furniture. It’s really awesome. What Zede taught Mal about the expensive cost of the furniture is that they come with a machine lift. 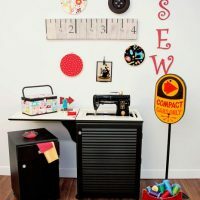 Through running the Self Sewn Wardrobe Facebook group Mallory has witnessed many people say they wish they had this or that to sew on and she believes sewing furniture could change the game for them. What comes to Mal’s mind is a smaller piece of furniture (they come in many different sizes and levels) by Koala that was around $1,000 called the Cub and Arrow makes a similar one called the Sewnatra. Both of these cabinets will hide away your machine quickly and offer some storage and extra table room to the left of the machine for your supplies or bulkier projects. Example of the Arrow Sewnatra Cabinet closed up and then open and ready to use! 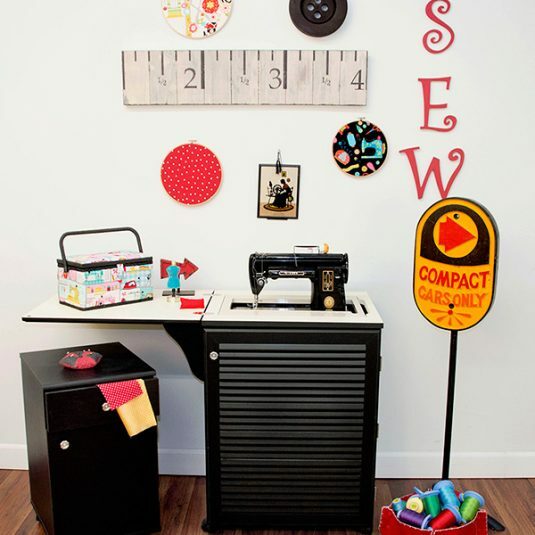 Browse Arrow Sewing Cabinets. The lift allows the machine to hide away in the cabinet. You can change the level at which you sew. You can have the machine table height or have it sunk down so the throat is flush with the cabinet. There is usually an insert available that wraps around the machine so there are no gaps between machine and cabinet top making a giant extension table. 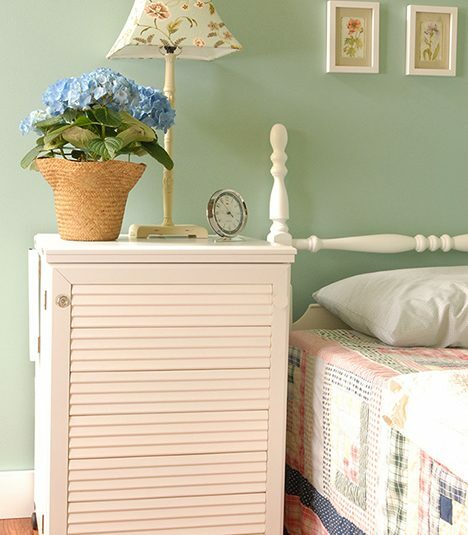 This is great when sewing large bulky projects like bridal gowns, quilts, or draperies. These inserts can be made for almost any machine whether you have an older machine or a brand new one. Have a few different machines? You can have a few different inserts, making it possible to utilize your furniture no matter what machine you want to use. Raise the machine up and you can have the free arm available or attach the embroidery unit. Mallory feels these two smaller pieces of sewing furniture would fill many peoples needs. Electronic lifts became necessary as sewing machines became larger. Something Mallory and Zede heard a lot when they ran the shop was “why is the furniture so expensive?” Zede and Mallory found this interesting especially when many of these people just paid $7,000-$12,000 for the machine. They aren’t money shaming anyone, we recognize that $3,000 for a large piece of sewing furniture is not nothing but they also wonder why people are so surprised at the price. These are custom built heavy duty cabinets with electronic lifts built to enhance your sewing experience and will generally last a lifetime. Zede says of course its ok not to go this route (she didn’t have sewing furniture until later in life) but keep it in mind as your sewing progresses, it might be something you want later. She also says not to be shocked by the price, it’s really a good value and it will last forever. Mallory recalls how excited and relieved people were to have a dedicated piece for their machine when she would deliver floor model furniture. It can really enhance your sewing experience. The ergonomics offered by these pieces are better for your body and sewing efficiency. The higher end furniture pieces will allow you to customize the height too. So if you like to sit in a higher chair or stand to sew (maybe you embroider a lot) or maybe you are 5’1″ and need something shorter you can get exactly what you want. Zede and Mal have furniture that doesn’t close up. They have a dedicated room for their machines and leave them out. Some of their tables are convertible with a leaf in the back. Tables and cabinets will have different levels of convertibility, storage, and machine hiding abilities. Mallory is really loving the vertical pull out thread storage furniture companies are adding to their lines. It keeps the thread visible when you pull it out and then covered from dust when pushed inside the cabinet, such a space saving design too. They also really love that many of these sewing cabinets come on casters so they can be moved around as needed. Zede says these rooms look great but then you try to work in them and it’s not as great. She figured this our when she was sewing at a school and she really didn’t like the limitations. You are stuck with a configuration. Here is what Zede knows about people who sew; they are clever, creative, investigative and don’t plateau. She believes, ” your sewing today might not be what your sewing is in 5 years”. You may have different machines and different projects, keep things moveable, your needs may change. Mallory loves that there is a luxury end to this furniture but there is also a very practical end to it. There are also cutting tables that are stand up height and some have gate leg tables that allow these to be very space saving. Some will have added storage and some are bare bones. Some furniture is just for storage. So no matter what your needs, there is something available.